"This bed is too big. . . "
Frankly, Goldilocks would've never even tried out my bed. She would've taken one look and headed to the next one. Of course, the Papa Bear in our house is 6 feet 7 inches tall. So our bed needs to be pretty big. 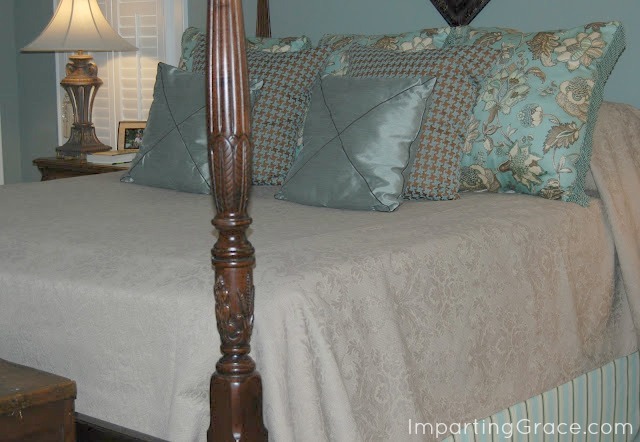 We have a king-size bed with an extra-deep mattress and a memory foam topper, and though I was able to locate extra-deep sheets that fit, I was always stymied trying to find a comforter or coverlet that actually covers the bed. I always kept my fingers crossed that no one would go into my bedroom and look at my husband's side of the bed, where the spread covered only about half the side of the mattress. When we have company, we always have people put their coats on our bed (does anyone else do that?) But I hated that exposed side of the bed. It always felt like my slip was showing or something; know what I mean? 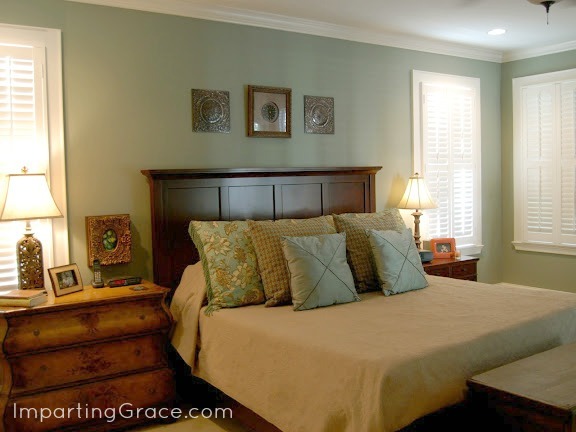 To cover the whole mattress, I needed a spread that was 112 inches wide, which I could not find. So what do you do when you can't buy what you need? You make your own! 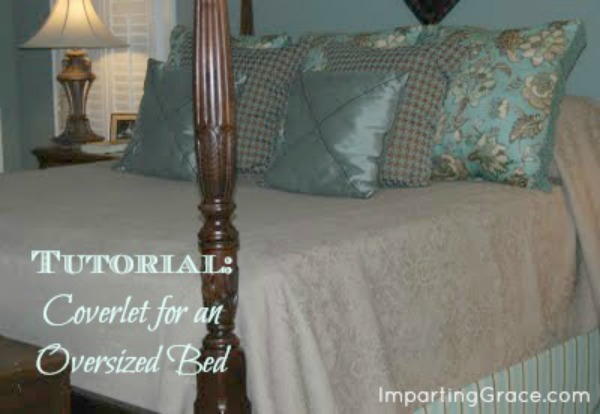 And I'll show you how I made my extra-deep, extra-long coverlet. It was so easy, I wondered what took me so long to think of it. Well, actually, I know why it took me so long. It's because of my extremely elementary sewing skills. The truth is, I am a horrible seamstress. If someone asks, "Do you sew?" I answer "Not really." I can sew straight seams, and that's about it. But I'll tell you what I can do, and you can do it, too. I can PIN. So if I think of something that I'd like to sew, I design it in my head or draw it out on paper, then I cut out the fabric and pin, pin, pin. I have a very inexpensive sewing machine, and all I do with the machine is sew the straight seams of the things I've pinned together. Now, back to the bed. I admire the look of beds that are made with sumptuous sheets folded back and pillows displayed beautifully, but that has never worked for me. I make my bed every morning, and I prefer to spend as little time as possible making it. I found wonderful fabric at my local discount fabric store, Not Just Linens. 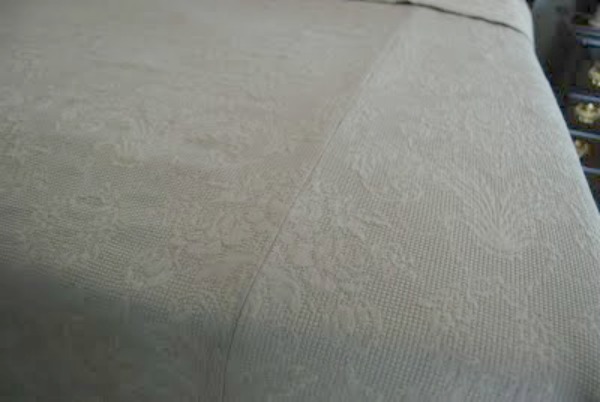 Like all the fabrics there, it was $7.99/yard, and like many of the fabrics, it was 57-58" wide. I bought 8 yards for a total cost of $64. The pattern on the fabric repeats every 22 inches, so I bought enough to make sure I could match the panels of the spread. I could have made the spread with less fabric, but considering my sewing skills, I knew it was better to be safe than sorry. 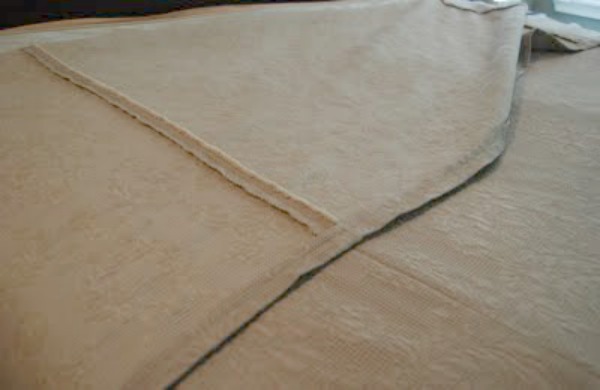 As for the actual construction of the coverlet, I just cut one piece of fabric 114" long. I used this for the center panel of my bedspread. Then I cut an identical second piece of fabric so that I had twin panels, each 114" long. I split the second panel right down the middle lengthwise, so that I had one full-width panel and two half-width panels. Next I pinned one half-width panel to one side of the (full-width) center panel and one half-width panel to the other. This was the slow part, because I wanted the pattern matched as closely as possible. After it was all pinned together, though, it was a cinch to sew. Two long straight seams later, I had a huge spread. I finished the project by ironing the two seams flat and then sewing a machine hem all the way around the perimeter. And now I have a bedspread that fits my humongous bed with no sheets or blankets peeking out on the side. No more slip showing! For $64 and a bit of my time. I made the pillows, too; click here for the how-to for those. Update: After I made this coverlet, bedskirt, and pillows, we got a different bed. 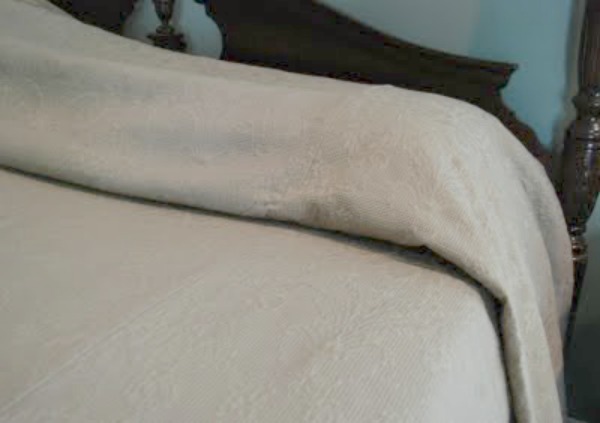 Our new bed doesn't require a bedskirt, but I think the coverlet and pillows look great with the new style, too! Wow, Richella, you really did DIY!! It looks fantastic and I really love the colors!! Great job! Great idea! I have an old vintage bed that is so high off the ground I practically need a ladder to get into it. I've had to improvise as well. i have the exact same problem, what a fabulous solution. it's beautiful. i love the fabric & your technique. Richellllllaaaa...love it...the pillows are just gorgeous as well. I should take sewing lessons from you. Your bed cover looks beautiful! Looks great! We have an enormous king size bed too. Oh my goodness! It's BEAUTIFUL! That fabric was only $7.99 a yard? You did good, girl! Beautiful, simply beautiful! Great job! You did such a great job! Your bedding all looks so beautiful together :) Love it all! You done good! It looks great! great job and I really like the colors. Gorgeous! What a fabulous idea. I have the same problem with "my slip showing". But unlike you, I cannot even sew a straight line. Maybe I can enlist the help of my big sis. I need one of these big ol' coverlets to hide my slip! I made my own expensive looking typography basket~come see. I have the EXACT same issue. Embarrasingly, DH and I have separate covers, because there's not one big enough for a California King with a 8 inch memory foam mattress! What a great idea! I wonder how it would look if you used two different fabrics and made sort of a "striped" effect by alternating them. Hmmmm... I see this as an upcoming Transformation Thursday! Just wanted to say hi and thanks for stopping by my blog the other day. You have a really cute layout. Who is your blog designer? Spill it!! Love your entire bed. Did you make your bedskirt? I have a large, four poster king bed with a "fat" mattress, and can't find an appropriate pleated bedskirt. Wow, what a great job!! Who needs to fold back when you have to marvelous pillows! I too have to make my bed EVERYDAY. Maybe this will encourage me to work on my bed. We have the opposite problem where we bought a king size duvet for our queen size down comforter. It bugs me. I can sew a straight line too. = ) Way to inspire. Great job!! I am very impressed. I LOVED meeting you yesterday! It was such fun. Getting to know you was one of the highlights for me, for sure!! Blessings! Yay for you! What a great job you did and such a creative solution! I have exactly the same problem. 6'5" husband, 80" x 78" mattress with pillow top on a sleigh bed. I'm going to need about a 20" drop on each side. I'm just about to make my own coverlet. We live in South Texas and I don't want anything heavy. This will be the perfect solution.